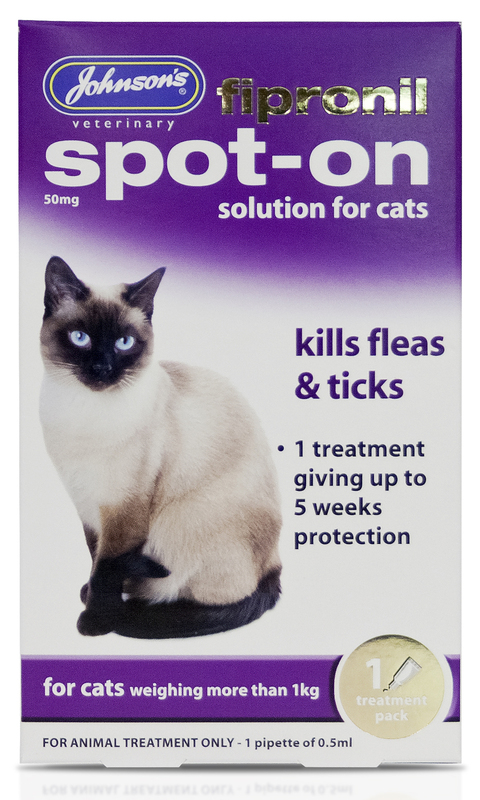 Johnson's Fipronil Spot-On is used to treat and control infestations of fleas and ticks on cats. Once applied it can produce immediate effects and persistent activity on for up to 5 weeks, while ticks will be killed within 48 hours. The active ingredientis Fipronil (50 mg per pipette). Other ingredients are: Butylhydroxyanisole (E320) and Butylhydroxytoluene (E321). Place the tip of the pipette on the skin and squeeze gently at one or two spots to empty the contents onto the skin. It is important to make sure that the product is applied to an area where the animal cannot lick it off, and to make sure that treated animals do not lick each other following treatment. Care should be taken to avoid excessive wetting of the hair with the product since this will cause a sticky appearance of hairs at the treatment spot. However, should this occur, it will disappear within 24 hours post application. For the optimal control of fleas and ticks the treatment schedule can be based on the local epidemiological situation. In the absence of safety studies, do not re-apply the product for a minimum of 4 weeks after treatment. There are currently no questions for Johnson's Fipronil Spot-On for Cats - be the first to ask one!